Easy and delicious chocolate ganache cake roll recipe. 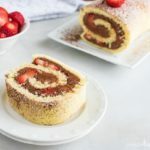 Just a few simple tricks and you will have the perfect cake roll. Preheat oven to 375F. Line a jelly roll pan with buttered foil or parchment paper. Set aside. Beat the eggs and then gradually add a cup of granulated sugar. Stir in water and vanilla extract. Sift in the flour, baking powder, and salt. Fold the batter together and pour the batter into the pan. Bake in the oven for 15 minutes. Cake will be springy to the touch and start to shrink away from the sides of the pan. Lay out a sheet of parchment paper slightly longer than the cake and sprinkle lightly with powdered sugar. Take off the foil or parchment paper and cut away the crusty edges of the cake. Roll the cake up in the parchment paper sprinkled with powdered sugar. Place in the refrigerator to cool. Combine the heavy whipping cream and chocolate chips in a saucepan on the stovetop over medium low heat, stirring until smooth and chocolate has melted. Pour into a metal mixing bowl and refrigerate chocolate ganache until cold. Whip chocolate ganache on high in a stand mixer until cream is thick. It will be a light brown color. Unroll the cake and spread the chocolate ganache over the cake. Add strawberry slices over the top of the chocolate. Tightly roll the cake back up and refrigerate for an hour before serving. Enjoy!